What is the lifestyle of a Buddhist nun like? Believe it or not, I had to look up “lifestyle” to think about how to answer your question. Here’s what I found: lifestyle n. A way of life or style of living that reflects the attitudes and values of a person or group. Because you asked specifically about nuns, I will respond from the female perspective. Note, however, that most of my reflections here apply to Buddhist monks as well. Buddhist teachings maintain that the causes of suffering reside in our own minds, and that all beings have the potential to eliminate them completely. With reasoned confidence in this tenet, Buddhist nuns and monks of all Buddhist traditions practice to transform their minds to achieve that aim. Monastics in some traditions take it a big a step further. Following the doctrine of what is called the Universal Vehicle (Mahayana), they practice with the wish to become fully awakened in order to help all beings realize their potential to be freed from unsatisfactory conditions. The monastics of Sravasti Abbey, where I train, follow the latter tradition. 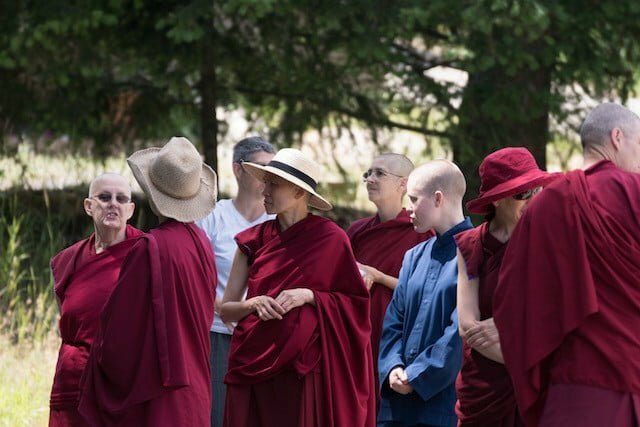 When we ordain, we take specific precepts that guide our behavior—10 precepts for novice nuns and 348 for fully ordained nuns in our particular tradition. These instructions, laid out by the Buddha, form the skeletal structure of a lifestyle designed to keep our minds focused on our spiritual aims. How these are put into practice in daily life vary from tradition to tradition and from monastery to monastery. Nuns who live outside of a monastic community must develop their own ways to implement the guidelines. But basically, we’re all following the same rules to realize similar aspirations. For example, the two most evident signs of a Buddhist nun’s lifestyle—shaved heads and monastic robes—are explicit symbols of our spiritual values. Hopefully, if she is well trained, a nuns’ demeanor will also reflect her inner practice. 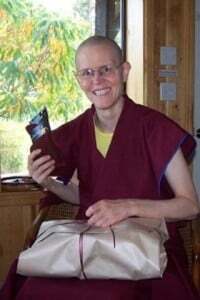 Buddhist monastics cultivate inner beauty and drop fixation with making ourselves physically attractive. We shave our heads to symbolize letting go of worldly concerns, specifically to “shave off” the poisoned minds of ignorance, anger, and clinging attachment. Since our hair is often a point of vanity—for men as well as women—nuns simply avoid that fault by doing without. Practically speaking, it saves a lot of time and money not to be fussing with “doing” one’s hair. We also wear the same outfit every day—the robes of a Buddhist monastic—and forego jewelry and makeup. This, too, is immensely practical. (Have you ever been paralyzed staring into your closet wondering what to wear that day? Buddhist nuns do not have this problem.) There’s a rich symbology about the various aspects of our robes, too detailed to enumerate here, but donning the robes each morning reminds us of Buddha’s teachings. Buddhist monastics are celibate. This is also practical. Since we’ve decided we want to focus our lives toward spiritual practice, strictly practicing celibacy frees us from the distractions of flirtation, romantic involvement, and family. That’s good for our meditation practice and helps us develop equal love for all beings, not just our romantic other and families. Following the Buddha’s guidelines, nuns also refrain from listening to or playing music (except chanting in a spiritual context), dancing, or watching entertainment. That means no music videos, disco nights, gaming arcades, or movies except for relevant documentaries. People ask, “What’s wrong with music?” Nothing at all. But when we sit to meditate and a bouncy tune overtakes our mind, it’s a big distraction. That’s a problem Buddhist nuns dohave sometimes. Those tunes stay buried in our minds for decades or lifetimes! Further, no matter how sacred the music or the context for it, it’s very difficult for music performers to shed every shred of a motivation to be seen, admired, and appreciated. This wish for praise, to stand out, is the opposite of a Buddhist nuns’ practice of humility. Not all Buddhist monastics are vegetarian, but many are. Since Buddhists have profound concern for all living beings, we don’t want to contribute to their suffering. Therefore, we refrain from eating their bodies. We follow a vegetarian diet at Sravasti Abbey. These are the obvious signs of the lifestyle, but for Buddhists—ordained or lay—the emphasis is on developing an internal focus. We practice the outer to work with the inner. Meditation, study, and even service are all aspects leading to mental /emotional development. There are many styles of meditation, all designed to help us calm and concentrate our minds and change our often-negative, habitual ways of thinking. Consequently, daily meditation practice is a central part of a nun’s a lifestyle. At Sravasti Abbey, we meditate together twice daily—early morning and early evening—and spend some months every winter in extended silent meditation retreat. Study, too, is an important daily activity. The human mind is complex, and the Buddha’s teachings are vast. It takes a lot of understanding and practice to replace anger, for example, with love, or jealousy with a genuine rejoicing in others’ good fortune. 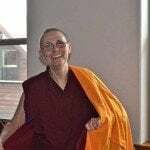 Consequently, monastics seek out teachings from Buddhist masters, reflect on what they’ve heard, and study how to bring the teachings to life in themselves. Study also fuels our meditation practice. When we’re not engaged in explicit spiritual practice, we bring our values into “offering service”—what most people call work. It’s critical to our spiritual aims that we work to benefit others. At Sravasti Abbey, this takes many forms—from cooking for the community and guests to corresponding with prison inmates; from supporting homeless teens in our rural county to editing and posting videos of Buddhist teachings (see the Sravasti Abbey YouTube Channel)) and general advice on how to deal with the problems of day-to-day life. These are some general aspects of a Buddhist monastic’s lifestyle. There’s much more to it than can be told here. You can see how the Sravasti Abbey schedule is designed to support spiritual practice by browsing the Day in the Life page. Better yet, come experience a Buddhist monastic lifestyle by visiting Sravasti Abbey. Guests are welcome to spend a day or longer living in a Buddhist monastic community. You don’t have to be Buddhist to visit. Details for how to do this are in the Visit section .